Paper on customer segmentation in retail facility location planning accepted for publication in BuR Business Research. Recently, there has been a growing body of literature concerning the incorporation of customer demand - described by discrete choice models - into facility location models. Considering only locational decisions, linear reformulations of the non-linear multinomial logit model (MNL) are already available. The MNL exhibits the independence from irrelevant alternatives property (IIA). The IIA implies that all facility locations are assumed to be equivalent substitutes to each other. In general, empirical studies evidence that IIA is not valid in spatial choice contexts. In this contribution we present a facility location model to maximize firms' patronage while demand is determined by an MNL. We account for customer segmentation and hence may reduce the IIA bias on patronage. Numerical studies show that averaging customer characteristics yields a bias of more than 15% of the objective function value compared to segmentation. Using GAMS/CPLEX we are able to solve problem sets with 2 segments, 500 demand points and 10 potential locations to optimality in one hour computation time. If we consider 50 potential locations the gap reported by CPLEX is less than 8% in one hour. We apply our approach to an illustrative case example of a furniture store company expanding its network of branches in Germany (data is made available). The case example shows how our approach enhances managerial decision making. Moreover, numerical examples evidence the practicability of our approach. 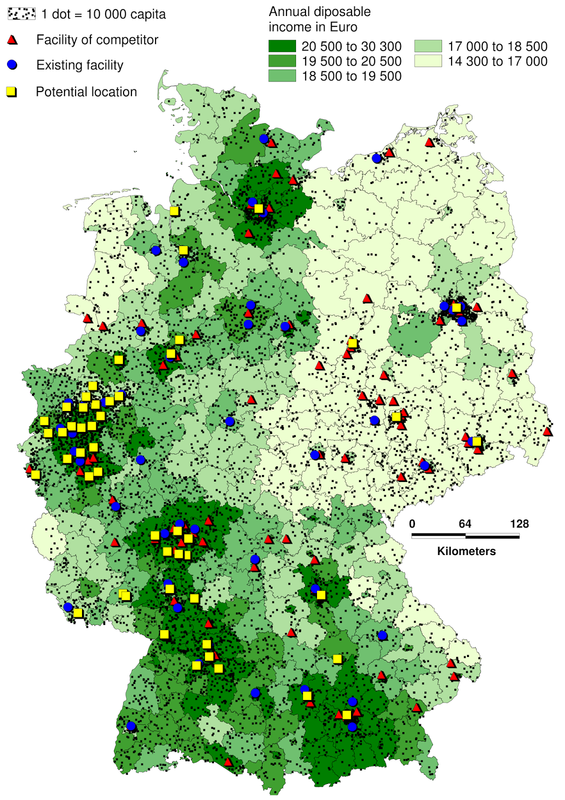 Citation: Müller, S., Haase, K. (2014): Customer segmentation in retail facility location planning. BuR Business Research, accepted for publication.